Snoop Dogg Invests In Philz Co.. In French, the expression for window shopping is, lèche-vitrine, literally “window licking.” Walking down rue du Faubourg Saint-Honoré, window shopping was the only kind of shopping I was going to do. Hermes, Chanel, Givenchy, Yves Saint Laurent—these are the kind of stores a normal person wonders if they even have the right to enter. It was no surprise that I walked past one window with a gold ring in the shape of a horse head, completely encrusted in diamonds. A mere 95,000€, or was it 55,000€? I can’t remember because whatever it was, it was more than a freelance writer’s salary would bring in in a year. Home to the Elysée palace, the residence of the United States Ambassador to France and the British Embassy, as well as some of the most high end boutiques that Paris has to offer, rue du Faubourg Saint-Honoré is a destination in and of itself, a step into another world, where the average person is immediately escorted out of their usual comfort zone. It is a place where nothing is reasonably priced. Except for the coffee. Because it is here, in a courtyard, just off the luxurious street that the newly opened Honor Cafe is serving up coffee, lunch, and pastries, in a surprisingly casual and relaxed setting. Opened in February, Honor is run by an English-Australian couple, Angelle Boucher and Daniel Warburton. Having both worked the London coffee scene for several years, they knew that it was time for something new. With a desire to open up their own place, when the opportunity to do it in Paris popped up, they jumped at the chance. “We wanted to do something different,” says Warburton. And different it is. For starters, it’s an “outdoor” cafe. Think of it like a greenhouse that doesn’t have plants but serves coffee instead. The space was conceptualized and built by the design firm Studio Dessuant Bone, and Epi Studio, who builds bespoke furniture. The structure features a bar just next to the Synesso machine, and you’re welcome to pull up a stool and have a chat while your coffee is made. The other big difference for the Paris coffee scene is that there isn’t any filter or pour-over coffee available. But instead, working off of a Mahlkönig EK43, they are serving up “filter shots”, a nod to Matt Perger’s Coffee Shots. 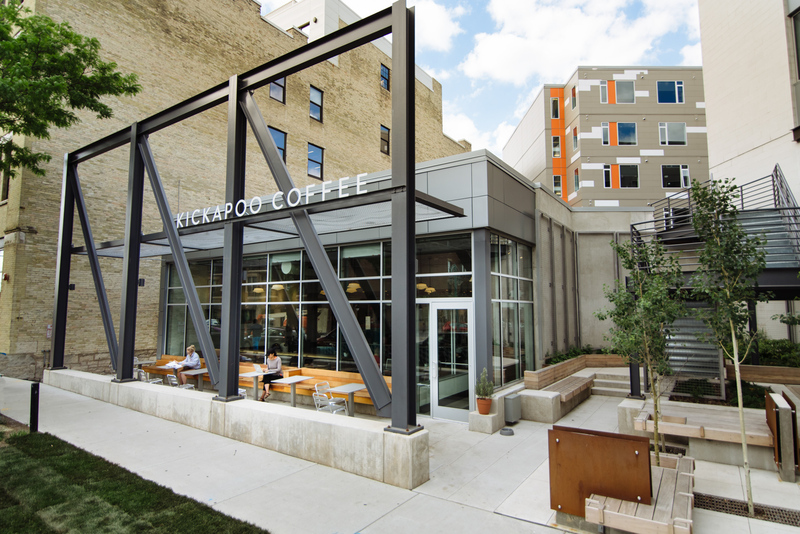 “We just wanted to try different ways and keep improving the coffee scene,” says Boucher. I ask whether it’s intimidating to be in such a flashy area of town. “I think everyone deserves good coffee,” says Warburton. “We have good English tea for the Brits as well,” Boucher chimes in, nodding to the British Embassy just across the street. Working in an outdoor space has its difficulties, particularly right now during winter. “This is a measure of our sanity,” says Warburton holding up the thermometer. “So what’s your cut-off point?” I ask. “When it freezes!” says Boucher. Because that’s when they can’t get any water to pull espresso shots. She later lets me know that she is wearing seven layers of clothing. And it’s a balmy winter day. Coffee is served in bright blue Acme Co. cups—Honor is the first to have the New Zealand brand in France—and pastries come from local favorite Broken Biscuits. They are perfectionists and sticklers for cleanliness, as any good barista should be. Warburton shows me the espresso basket, which is sparkling clean. In London he used to train baristas, and he would encourage them to employ what he calls “the lick test.” Ask yourself if you would lick the basket and if you would, that’s when you know you are keeping things clean enough and doing your job right. Which reminds me, now that I have had my coffee, I have window licking to get back to. Honor Cafe is located at Courtyard of 54 Rue du Faubourg Saint-Honoré, Paris.